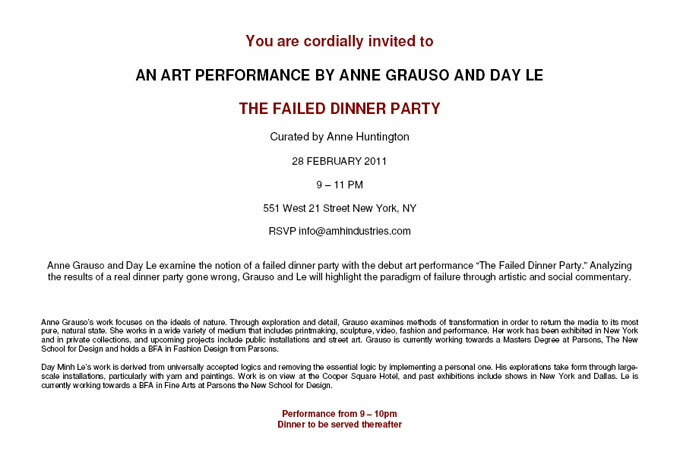 You are cordially invited to an art performance by Anne Grauso and Day Le: The Failed Dinner Party, curated by Anne Huntington. Grauso and Le examine the notion of a failed dinner party with the debut art performance “The Failed Dinner Party”. 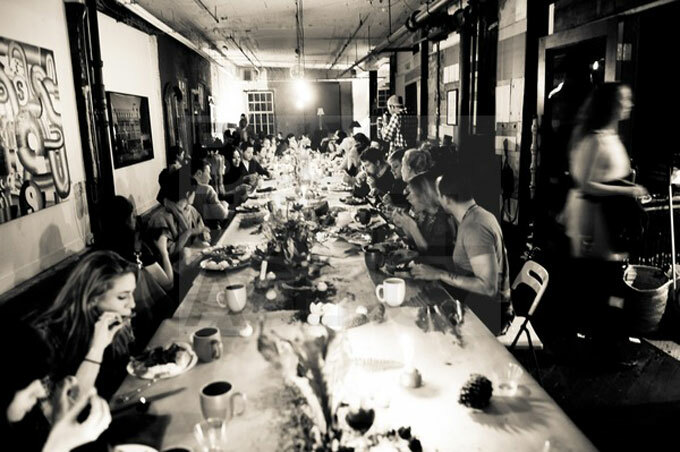 Analyzing the results of a real dinner party gone wrong, the artists highlight the paradigm of failure through artistic and social commentary. Anne Grauso’s work focuses on the ideals of nature. Through exploration and detail, Grauso examines methods of transformation in order to return the media to its most pure, natural sate. She works in a wide variety of medium that includes printmaking, sculpture, video, fashion and performance. Her work has been exhibit in New York and in private collections. Grauso is currently working towards a Masters Degree at Parsons, The New School for Design and holds a BFA in Fashion Design from Parsons. Day Minh Le’s work is derived from universally accepted logics and removing the essential logic by implementing a personal one His explorations take form through large schale installations, particularly with yarn and paintings. Le is currently working towards a BFA in Fine Arts at Parsons the New School for Design.